Relentless Financial Improvement: Why do high earners still live paycheck to paycheck? Why do high earners still live paycheck to paycheck? When I first started working part time in high school, things were great. I could finally earn money to buy the things I wanted. I no longer needed to ask for things from my parents. If I wanted something, I just had to put in more hours. I got my first full time job making 35K a year in 2008. I moved to Reno, Nevada and rented a room out of a big house for $500 a month with all utilities included. Life was good; I was making real money! This was when I first heard about 401K retirement plans. I went to the HR of my office and then found out that first year employees were not eligible to participate in the company 401K plan. I gave up thinking about investing and told myself I would start contributing to my retirement when I made more money. I paid off all my credit card debt and started saving a little bit of money with each paycheck. Then the new Apple MacBooks came out, and I had to have one. Then the new Apple iPhone came out around that time and I had to have it. I started getting too lazy to cook for myself at home. I convinced myself that eating out saved both time and money. I often treated friends to drinks at the club. It wasn’t long before I was living paycheck to paycheck. My next big income jump was from 35K per year directly to 80K. This was in 2009 and I did not negotiate too much on my offer because our US economy was in recession and I was just happy to have the opportunity. I was now making some big bucks! Before I even started my 80K job, I purchased a brand new Lexus IS250 for around 36K. My 1999 Honda Accord (given to me by my loving parents in college), which was running smooth as silk at over 100K miles, suddenly wasn’t good enough for me. I was making big boy bucks and I thought it was time to upgrade my car. This locked me into 3 years of monthly car payments. 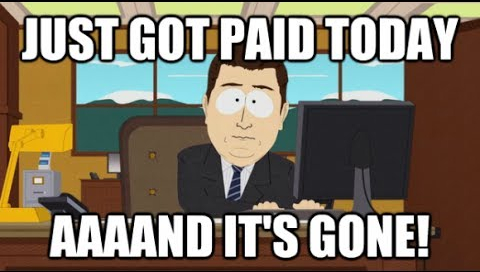 As my income jumped from 80K a year to 85K and then to 90K, I was finally able to start contributing some post-tax money into a Roth IRA and some pre-tax money into my company 401K. I also had the sweet opportunity to live at home rent-free. For the first time in my life I could really start to save some serious money. In 2010, not long after the US housing crisis, my family told me it was time to move out. I took a big personal loan from them to use as a home down payment. I went to a mortgage broker and bought as much house as my loan would qualify me for. At the time I thought “if they will approve me for a loan this big, my finances should be fine.” Plus everyone kept telling me that a “home was the best investment.” This caused me to buy much more home than I needed, a 4-bedroom home for a single person. One good thing that came out of the purchase was the low interest rate (4.25% at the time for a 30 year fixed mortgage). In hindsight, I should have looked for a smaller and cheaper home. With a new house came some new expenses. I had to get new furniture. I needed a new bed, so I figure why not buy the best bed possible? I ended up buying a $4,000 Tempur-Pedic bed. At the time I thought I got a great deal on my bed: no money down and 0% APR for two years! I bought a freaking bed on credit – this locked me into 2 years of monthly payments. Making mortgage payments really kills your cash flow when you’re used to living rent-free. To increase my income, I quickly found 3 housemates to rent the 3 extra rooms to. This worked out well, as the housemates were students at the local professional school. They paid for the majority of the house expenses and my rent was effectively reduced to around ~$300 a month! Time passed. I met my woman. She moved in and our housemate situation changed. One income now became two incomes. We started eating out more frequently. We signed up for DirecTV. We went to Starbucks all the time, almost on a daily basis. We both felt good about setting aside 10% of our income into retirement accounts. We leased a Toyota Prius for $0 down and locked in 3 years worth of lease payments at $342 a month. We started saving up for our wedding. Money got tight but we always seemed to find ways to come up with more cash flow. We always found one or two professional students to rent out rooms to. I did some teaching at the local university on the side for more income (I still do once or twice a month). Even with extra income, we still ended up living paycheck to paycheck. We realized that we were still struggling with our finances, despite both having good incomes and steady raises. By now we were almost pulling in 200K a year. And yet we had a pathetic amount of savings and investments. Every time we seemed to start saving up some money, something would come up and deplete our cash stash. Something needed to be done or else we would find ourselves working forever. That’s when we started reading about the FIRE (Financial Independence and Retiring Early) philosophy of handling money. We discovered amazing forums such as Bogleheads.org. We discovered amazing bloggers like Mr. Money Mustache and Jlcollinsnh; they taught us that life was not about this never ending stressful cycle of working and spending. When living paycheck to paycheck, you don’t have any freedom. Reading articles from bloggers that retired early (or are on their way towards early retirement) gave us the drive to start on our own financial journey. Newly motivated, we started making big changes to our finances. We cut out frivolous expenses like eating out every day and satellite television subscription. We stopped going to Starbucks every day. We switched to cheaper car insurance. I finally paid off the car I purchased in 2009 and the bed I purchased in 2010. It felt good to not have to deal with those monthly payments. When our lease ended, we were able to purchase another car in cash so that we would not have to worry about any more car payments. We started to save and invest more. We discovered the benefits of credit card points to help us save money on travel expenses. I started this website to share our financial tips and progress with friends and family. I used to think that making more income would solve all of our financial problems. It’s not just lower income families that find it hard to save money. A recent study finds that 1 out of every 4 families making $150,000 a year or more is living paycheck to paycheck. 1 out of every 3 households earning $50,000 to $100,000 per year live paycheck to paycheck. And 1 out of every 2 families making $49,999 or less per year live paycheck to paycheck. Spending without thought will easily ruin your financial security. We have friends that live in nice houses, drive nice cars, and yet are always complaining about money. Having nice things doesn’t make you successful or wealthy. For example, one of our mutual friends brings in over 500K a year, yet is always complaining about not making enough money and needing to pay bills. They lease 3 vehicles and spend over $1,500 a month on cars. They have high student loan balances. Their child has a lot of after school activities. They live in an area that has a high cost of living: higher mortgage payments, higher property taxes, higher home insurance, higher car insurance, and even more expensive gas. Depending on your expenses, how much you spend can easily kill your budget. While having more income definitely helps, changing our lifestyle has made the biggest difference in our finances and our quality of life. Bogleheads are constantly advocating others to LBYM, or live below your means. We found that cutting back on expenses and investing more wasn’t difficult to do once we made a commitment to work towards financial freedom. We’ve been saving 50% of our income over the last year and it’s definitely pulled us out of our paycheck to paycheck lifestyle. We have an emergency fund that will cover 6 months worth of expenses and we are working to increase that fund to cover 1 year of expenses. We’ve both worked hard and continue to advance in our careers. Recently we started investing in our son’s 529 college fund. Everyone’s financial situation is different. We all have different struggles. Once you start saving more and paying yourself first, you can break the cycle of living paycheck to paycheck and work towards financial freedom. Life gets much better after that. Financial emergencies may always continue to pop up, but you will be better equipped to tackle those situations. We are working hard and can’t wait until we hit financial freedom. This will allow us to work less, travel freely, spend more time with family, and volunteer more. Life is long, plan accordingly.